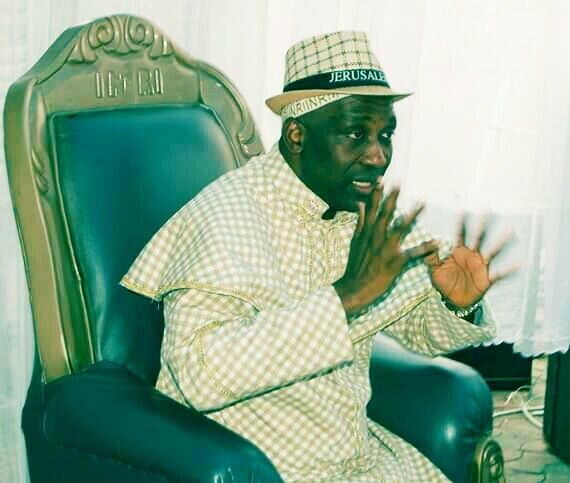 Prima te Babatunde Elijah Ayodele, the servant of most high God at ‘INRI Evangelical Spiritual Church’, Oke-Afa, Lagos, South-West, Nigeria is a prophet who his earlier prophesies have came to pass on several occasions. Last Saturday, the very humble and most philanthropist man of God rolled out his yearly prophesies for 2019 and beyond. He also used the gathering to present his prophetic book titled ‘Warning to the Nation 2018/2019 and beyond to the media. In the book, the Ekiti born servant of God released shocking revelations about Nigeria and other countries. He revealed the revelations as they were revealed to him by the most high God in politics, economy, education,security, sports, entertainment and others. Some of the revelations were below for your consumption. The spirit of God revealed to me that in Nigeria many of the Government Agencies and Parastatals will be merged. Various issues will come up, that will be instrumental to the merging and scrapping of some of the Government Agencies. Let us pray against genocide in Nigeria. We must pray against blood bath and crisis situations that will be worrisome in the country. Let us pray against street protests against the government and the stoning of some politicians. Let us rebuke the writing of negative stories with intent to dent the image of Nigeria and the Citizens. I foresee that many Nigerians will be frustrated. The problems of the herdsmen will soon fizzle out. The Nigerian government should be alive to its responsibilities on security threats in the country. Let us pray so that no King, Obi, Eze or Emir will be stabbed or shot to death. I foresee that the people from the Eastern part of the country that is the area agitating for the state of Biafra will stage public protest. I foresee that women from this area will go on rampage and stage a protest naked. Many Nigerians will complain loudly. I foresee that the Government will mismanage the recovered money and other monies recovered from other sources. The spirit of God revealed to me that the recovered loots will not be disbursed accordingly or spent judiciously. Political patronage and not merit and performance. The agricultural sector will need much support and backing of the banks but the Lord said loan seekers will meet brick walls. Farmers will solicit for money to develop agriculture but will be disappointed. There will be outbreak of Bird-flu that will kill a lot of birds in the country. Most of our local rice will get there someday. To boost food production, government will continue to mouth rearing of animals, fish farming and snail farming; but the government will not go beyond lip service in this regard. I foresee cases of fraud in respect of money set aside by government to support agriculture. There will be more money from the sale of cocoa produce this year. CASHEW The price of Cashew nuts will go up. CASSAVA Cassava will be very expensive in the year HIDES AND SKIN The price of hides and skin will rise in the market due to higher demands. There will efforts by groups and individuals to frustrate the election. The Independent National Electoral Commission [INEC] will be confused. The card readers deployed by INEC to verify Voters detailed information will not work in most places. There will be outcries by voters as the card will reject many intending voters. INEC should pray against the burning down of its office as the electoral body will face challenges. Concerning INEC officials, there will be problems for them. They will need funds. Election in Nigeria 2019 needs a lot of prayers and guidance because the election will cause a lot of troubles. right election results. Money will be used apart from intimidation. These are the words of the Lord. NLC The Nigeria Labour Congress and the government will have lot of issues because of the remuneration of workers. The Labour Minister will deceive the workers by not telling them the actual outcome of their discussion with government on workers welfare packages. The NLC will behave like a toothless barking dog because the NLC negotiating will not have what it takes to achieve success. John Elton, Olubadan of Ibadan: Oba Saliu Adetunji, Akintola Williams, Robert Mugabe, Tabo Mbeki, Folake Solanke, Lateef Jakande, Jeremiah Oseni, Ibrahim Babangida, Abdusalami Abubakar, Shehu Shagari, Babagana Kingibe, Abba Folawiyo,Subomi Balogun, Awujale of Ijebu Land: Oba Sikiru Adetona, Otaru of Auchi: Alhaji Aliru Momoh, Owaobokun of Ijesa Land: Oba Adekunle Aromolaran, Obong of Calabar: Edidem Ekpo Okon Abasi-Otu vi , J.P Clark, Chief Tony Anenih, Asiwaju Ahmed Tinubu, Pius Akinyelure, Alex Ferguson, Dr Yomi Finnih, Dr Fredrick Fasheun, Peter Odili, David Jemibewon, Attah of Igala: Dr Idakwo Ameh Oboni, Pele of Brazil: Edson Arantes do Nascimento, Ewi of Ado Ekiti: Oba Rufus Adejugbe, Emir of Ilorin, Alhaji Zulu Gambari, Mike adenuga, Gabriel Igbinedion, Aretha Franklin, Most Reverend Samuel Abidoye, Ebenezer Obey, King Sunny Ade, Kessington Adebutu, Maurice Iwu, Mr Babatunde Savage, Paul Ogwuma, Present Ilorin Chief Iman: Sheik Bashir Soliu OON Francis Arthur Nzeribe, John Odigie Oyegun, Jerry Rawlings, Patrice Talon, Vice President of Ghana: Mahamudu Bawumia, Malaysia Prime Minister: Mahathir Mohamad , President Mohammadu Buhari, Atiku Abubakar, Paul Biya, Alex Duduyemi, Rasak Okoya, Chukwuemeka Ezeife, Iyorchia Ayu, General Ike Nwachukwu, Wole Soyinka, Humphrey Nwosu, Bamanga Tukur, Bode George, Yakubu Gowon, Victor Olaiya, Bill Gates, Nasir El Rufai, Senator Abdullahi Adamu , Otunba Johnson Fasawe, Omololu Olunloyo, Oladipupo Diya, Richard Akinjide, Ernest Shonekan, Kofi Annan, Ban ki moon, Pope Francis, Jerry Gana, Amos Adamu, Issa Hayatu, General Tunji Olurin, President of Chad: Idriss Deby, Akran of Badagry: Aholu Menu Toyi, Alex Akinyele, Chinwoke Mbadinuju, Chief Emeka Anyaoku, Alhaji Hassan Danbaba, Prince Phillip, Arthur Eze, Senator John McCain, Chief Ayo Adebajo, J.K Randle, Sepp Blatter. These leaders need prayers for good health, divine protection and not to be bereaved. ls will be reviewed because many of them will be politically motivated. BUDGET 2019 This will not make for better results for the economy of the country. The government will make a budget proposal that will not be fully implemented due to reasons that cannot be fully ascertained. I foresee that in the budget for 2019 there will be a lot of controversies that will make the government not to understand the logic of the budget. The fact is the budget will be mismanaged irrespective of who will manage it. Thus, the budget will not serve the expected purpose. The National Assembly will pass the budget as quickly as possible but the fact is it will not be adequately and properly executed. I foresee that there will be killings that will make even the government to panic. I foresee the emergence of a new militant group in Nigeria that will be deadlier than the notorious Boko Haram. Furthermore, there is going to be flooding and let us rebuke death of an Islamic scholar and a leading Pastor. Let us rebuke the death of any former Senator or Federal Minister. There will be a new approach to Nigeria politics. I foresee that a new set of people will come up in Nigeria to play partisan politics. Let us be watchful so that there will be no kidnapping in a new dimension. There will be a lot of crimes. Corruption in Nigeria will still persist both in the political and economic fronts. Government will find different means to fight corruption. Corruption will be at the advanced level in the country. There will be serious needs for the international community to work with Nigeria in the war against corruption. Let us rebuke cholera outbreak, stealing of babies in hospital and unexpected explosions in the country. yet there will be no meaningful development. I foresee the creation of new local governments in some states to just serve the political purpose. In Nigeria let us rebuke earthquake, road and airline crashes and ship wreck. Let us pray against unexpected killings and oppression from Security Agents. The country needs to be watchful of killings and blood bath. Let us pray so that we will not lose any former governor. Kano, Kaduna, Kwara, Osun, Ekiti, Ondo, Yobe, Jigawa and Borno States must be watchful of threats to security The Nigeria government will be under serious threats from foreign countries and the Human Rights Groups due to violations of the people Rights. I foresee that the people will criticize the government of Buhari for so many anti people policies. I foresee series of avoidable killings that the government must do something on. Nigeria needs prayers a lot to achieve its desires. Let us pray not to mourn the death of any Chief Judge in Nigeria. I foresee that people will be angry. Nigeria will want to grow economically. Let us pray to rebuke the death of onetime President. We need fervent prayers to avert blood bath and strange happenings hither to unknown in the annals of the country. Whether it is the Buhari government or not we need prayers. The government will be wasteful in spending and the poor will still remain poor people. THE NIGERIAN SUPREME COUNCIL FOR ISLAMIC AFFAIRS – NSCIA The Council will constantly launch media and verbal attacks against Christians. The organization must be careful not to pose any serious problems to the country. There will be leadership crisis that can cause disorderliness in the Council. The NSCIA will sue for peace in the country. AFRICAN CHURCH OF NIGERIA They should pray not to lose any prominent member or leader. The African church Arch-cathedral Bethel Lagos must be careful so that there will be no challenges. There will be confusion in the setting. Let us pray not to lose any one among them. There will be leadership crisis and there will be the need for the church to be more prayerful. The Traditional Institution in Nigeria must be committed into prayers for divine protection. In South West, North, South East and the South-South we need to commit all the Traditional Rulers into prayers so that we will not lose a Prominent King suddenly and that no Traditional Ruler will be rubbished. I foresee that some traditional rulers will be implicated for wrong doings. The Kings need to be extremely careful and watchful so that none will be kidnapped. Let us rebuke fire incident in any of the Palaces. Let us be watchful so that the traditional institution in Nigeria will not be molested and ridiculed. I foresee that some traditional rulers will be dethroned while I foresee the burning of some Palaces. Some Obas will be taken to court. The salaries of Emirs, Obas and Kings in the Eastern parts of the country will be reviewed. In the nearest future I foresee that a very large percentage of all the present political parties will not be in existence again. There will be changes in their names. I foresee that there are states in Nigeria where the newly registered political parties will be accorded acceptability against the old political parties. I foresee that the APC wall will crack even as there will be disunity. The beauty of the APC will not be there again as the party will face a major challenge. will be making efforts to win at the center that is the Presidential post. The APC will not take things easy with the opposition political parties as there will be constant threats from the government. I foresee that the APC will have problems that will affect its activities nationwide. This may not be now but it will come up in the nearest future as the party will be rejected at the polls. The spirit of God says in a free and fair poll the APC will lose in the South-West Geopolitical Zone. If the PDP failed to pick the right candidate and also re-strategize the party will not achieve success as expected. The PDP must understand the terrain, form a political party that is ready to damn the consequences, pray fervently before they choose members and also work tirelessly to fight the APC before the PDP can win. The PDP supporters will fight the APC ruthlessly. The Electricity Distribution companies in the country will fail to install Meters for Private use. The companies will be taken to court. Their billing and mass disconnection exercises will cause problems for the companies. The government is yet to get it right on the problems of electricity supply in the country. There will be disagreement between the electricity distribution companies and the government even as crazy bills will persist. NIGERIA People will be angry because many things will not be going on as expected in the social and economic areas. I foresee that there will be many fake employment Services Agencies. Ghost workers will be detected in government offices. I foresee that government will introduce new laws to control the religious activities of Churches and Mosques. The activities of Scammers will become more rampant and government will take steps to curtail it. Let us pray to rebuke a disaster that will shake the entire nation vigorously. The spirit of God revealed to me that we must pray against disasters in these states: Kebbi, Jigawa, Bayelsa, Anambra, Imo, Sokoto, Kaduna, kano, Benue, Plateau and Lagos. I foresee that Government will use the issue of salary as a political weapon. Some state will owe their workers backlog of salaries. Payments will be done towards the elections so as to cajole Nigerians. explosions, tanker explosion and an increase in the cost of food stuffs prices. The prices of food stuffs will not be stable. The South West governors will take steps to start mechanized farming. I foresee that cases of stealing and armed robberies will take another dimension in the country. In Nigeria there will panics here and there because of the political crisis and the state of the economy. There will be armed robbery, kidnappings and political assassinations. As the spirit of God revealed to me there will be frustrations at all points before the new government will come. I foresee that the cabal will block the newly elected people from coming on stage. The year 2019 election will surprise a lot of people as there will be various moves and methods to be used for rigging purposes during the election. I foresee that the election will not be conducted in some parts of the country because of violence, fighting and shootings in some of the polling centers. Let us rebuke death in any of the INEC offices. Many qualified aspirants will be sidelined and this will generate bad blood in the parties. APC will do direct primaries in some states just to satisfy the party members which people will not be happy about because it will not be a free and fare election. From the new political parties they will not get the right person because of the level of ideas. of money. The technology will be locally developed by a Nigerian Engineer. The governor will make efforts but he will be blackmailed. The governor will be disappointed in his main Assistants. The government will owe salaries and pensions. His bid for a second term in office will be challenged. Some areas that are not developed in the state will cry out to the governor. The state needs to be watchful because the government will borrow money and source for fund for it to stabilize. The governor will be accused of various issues. expected. Let the state pray against boat wreck. There will be problem of land grabbers and communal crisis in Ondo state. The state will be confused because Obas will be troubled in the state. The state will want to increase its agricultural outputs. The farmers will need fertilizer and financial supports. Let us rebuke killings even as some commissioners will be indicted. Akure Airport will be shut down. Let us rebuke the death of any traditional leader in the state. Oyo state should pray not to lose a prominent person, a professor and a onetime lecturer. Some political appointees will face series of troubles in the state. The Oyo state branch of the Health workers will go on strike. Let the state pray not to lose any local government chairman and let them pray against fire outbreak. The state must pray not to lose any market head. Let the state pray against killings. Oyo state needs prayers for uplift. I foresee that the state will lose an Elder Statesman. Let us pray against cases of collapsed buildings in the state. The state must rebuke fire outbreaks in any of the palaces and markets. Let us pray to avert communal crisis in the state. Let us rebuke death and rowdy situation in the state. The Speaker should pray for long life. Let us pray for prominent leaders in the state for divine protection. I foresee the opposition will take steps to cause problems for the government. I foresee that the governor will be accused wrongly. Some people will gang up against the governor. I foresee the demolition of structures in the state that will be wide condemned. The Ladoke Akintola University of Technology will be shutdown or taking over by the federal government in the nearest future. Cocoa House will be closed down because the Oodua Group (owners of the property) will not be taking proper care of the structure. Let us pray for peace in Oyo state. I foresee that the outgoing governor of the state will take wrong steps. There will be problems in the process of having a new governor in the state. The state government will be owing workers salaries even as the civil servant will be angry with the government. developments. The traditional institution in the state will become stronger. The Ooni of Ife will perform a prominent role in the state. Let us rebuke the death of any of the Obas in Osun state. Let us pray against divisions among the Obas. In the coming governorship election in the state, the APC must re-strategize and put its house in order to win. The PDP must really work hard to break the record and win the state. I foresee that the party will call for a coalition with the ADP in Osun. I foresee that a serious coalition will unseat the APC especially in Osun and even at the Federal level. Boripe, Boluwaduro, Ife south, Ife central, Ejigbo, Egbedore, Ila, ola oluwa, Oriade, Isokan, Odo otin, Ede north: all these local governments should be committed into the hands of the Lord to avert any crisis. Osun state should pray not to lose any professor or highly respected chief. The state will make life more meaningful for the people by providing some infrastructures. Let us rebuke land disputes in Osun state. Let us rebuke blood bath and erosion in Ile-Ife. The state needs prayers for divine intervention. The governor will face some political challenges. The governor will experience political gang ups against him. Let us pray against explosions and Flooding in Lagos state. I foresee that the Lagos state deputy governor will be troubled as I foresee gang up against her post so as to deny her a second term. Let us pray not to lose any Oba in Lagos. Let us pray not to lose a prominent business man, politician and a Senior Advocate of Nigeria. Some people will gang up against the effort of the governor in the state. The government will generate more income from taxes. Lagos state needs prayers so that there will be no dark days in Lagos. I foresee that rain will cause havoc in Lagos state. I foresee the developments of new road networks. The spirit of God says Lagos state will not relax its upward review of the land use charge and this will be condemned and it will give the government problems especially towards 2019 polls. seeing a new Lagos where things will change positively. Let us rebuke fear and threats in Lagos. Let us rebuke the outbreak of diseases, killings and kidnappings. I foresee a group coming on board that will not be a threat to the political calculations of 2019 but that will become politically active and formidable after the 2019 polls. Lagos state health workers will go on strike and they will be having issues with the government. Let us pray against an emergency situation in Lagos state. At the Apapa Port, let us pray against explosions and also in any other Ports in Lagos state. Let us pray for God’s wonders in the state. The House of Assembly needs prayers for guidance against conflicts of interest. The Yewa people will cause major political threats in the politics of Ogun state. Ogun state needs prayers for protection. Let us pray not to lose any Oba and rebuke calamities in any school in Ogun state. Ogun should pray against flooding that will kill people and also pray against the activities of land grabbers and kidnappers. The Eguns in Ogun state will be sidelined. Let us pray against the death of a past governor and a Prominent Leader in the state. The APC and the PDP in the state will fight. There will be political tension in the state. The state will borrow money for its developmental projects. The Igbomina will have problems because they will plot against themselves. The state should pray for peace and unity. The state will want to move and succeed. Let us pray not to lose a prominent politician in the state. Let us rebuke the killings of students. Let us pray against major accident in the state. The Northerners in kwara state will have issues. Teachers in the state will ask for increment in their salaries. The spirit of God says the governor of the state will be attacked. He will decamp from the APC to the PDP. The state will do a lot to succeed. The Kwara state governor will be pursued by the EFCC. The state will face a lot of challenges. The present governor will be confronted with various problems. I foresee that his political foes will multiply. The APC and the PDP in the state will engage in bitter acrimony towards the coming governorship election. I foresee that the state will be in total confusion. There will be killings and assassinations. The people must pray against confusion in Ikere, Emure, Ido-Osi, Ikole and Ado local governments. will lose in Ondo and Osun.AD candidates Adefarati and Bisi Akande lost.  PM News29 Dec2008 says Killer drug will be on rampage. A brand of teething powder killed many children in Lagos.  City People Jan14 2009 page23 says we need to pray not to lose a prominent highlife musician. Dr Orlando Owoh died.  Eko Today 16 Dec 2002 page 3 says; the oil rich part of Bakassi will go to Cameroon. Nigeria handed over Bakassi peninsular to Cameroon.  Global ExcellenceNov29 2005 page10; says God revealed Stella Obasanjo’s death Stella passed away.  Breaking News of March 17 2006 page2 says Dr Chris Ngige will be removed as Anambra Governor. The court removed him.  Breaking News Aug 1 2005 page4 says unknown person will rule Lagos state. In 2007. Raji Fashola was elected governor.  Sat Champion Dec27 1997 page 29 says There will be serious plane crash in Nigeria; ADC plane crashed at Ejirin.  First Weekly Mag Sunday Dec9-15, 2007 page9;says Mike Okiro will be confirmed as Inspector General of Police.  WTN2002-2003 page 152 says Former Cross River Deputy Governor efforts will not be rewarded. Hon John Okpa resigned says he did so for peace to reign.